One of my favourite non-perfume smell is Earl Grey tea. There is nothing quite like opening a brand new box of tea bags and inhaling the dusty green scent of tea leaves infused with the sweet and fragrant smell of bergamot. Few fragrances are able to capture this smell, and in general, good tea fragrances are hard to find. 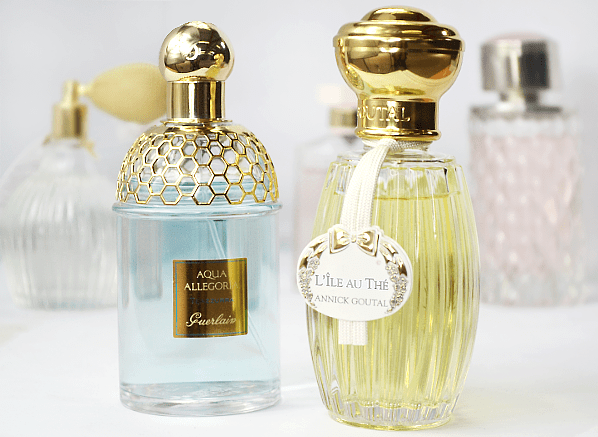 That said, Spring 2015 has seen the launch of two very competent tea scents; Aqua Allegoria Teazzurra from Guerlain and L’Ile au Thé by Annick Goutal, both of which are the subject of my Escentual column this week. Teazzurra is a more abstract take on tea that uses a green tea note alongside vanilla and citrus to paint the image of an idillic lakeside resort. L’Ile au Thé however, feels more grounded in nature and instead, evokes the smell of a soft breeze moving through the plentiful leaves of an exotic tea plantation. Both are light and wistful creations that set the mood for summer. Click here to head on over to the Escentual blog to read my review. Oh, and pop the kettle on! Sample of Teazzurra via Escentual. Sample of L’Ile au Thé via Annick Goutal. Image via Escentual. I write for Escentual as their Fragrance Expert. My views are my own. Posted in Annick Goutal, Escentual, Guerlain, Perfume Reviews and tagged Annick Goutal, Aqua Allegoria, Aqua Allegoria Teazzura, Escentual, Guerlain, L'Ile au Thé, Perfume Review, Tea, Teazzura, Time for Tea. Bookmark the permalink. I love the green tea scent of Rituals Tao range and vanilla in a fragrance is a must have for me! Brilliant write up ill read your review with great interest! To me Uncle Serge’s ‘Five o’clock au gingembre’ is a perfect aromatic expression of having a cup of Earl Grey with some delicious piece of pastry in the afternoon. And on the more affordable side of the perfume market I very much enjoy Eau de Gaga which is a green tea explosion from the start even though there is no tea present in the notes.